Almost 50 percent of the brain cells your baby is born with will wither and die during the first few years of life. This process, known as neural pruning, organizes the brain and makes it more efficient. The brain learns through experience. Events in your baby's life trigger electrical impulses to the brain, establishing neural pathways. The more a pathway is used, the more established it becomes, making it less susceptible to pruning. Just like a muscle, the brain works on the principle of "use it or lose it." Humans are the only animals whose brains triple in size during the first two years of life. If it were any larger at birth, a baby's head would not fit through its mother's pelvis. Any smaller, and the baby's survival would be in jeopardy. The brain grow to 75 percent of its adult size by age two, and 90 percent by age three. 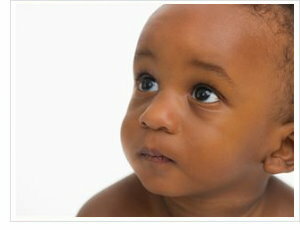 But just how does infant brain development occur? When your baby is born his brain weighs about 350 g (12 oz); by his first birthday it weighs 1 kg (2.2 lb). At birth, the brain already has some 200 billion neurons (nerve cells) - about the same number as it will have in adulthood. Each neuron responds to stimulation by growing a network of dendrites (branches) and synapses (connections) between itself and its neighbors. Each neuron ends up with dendrites leading to an average of 15,000 synapses. Dendrite formation becomes more complex over time, with third- and fourth-tier branches appearing by 6 months of age. The more stimulation the brain receives, the more sophisticated its dendritic networks become. The frontal lobe (the part of the brain that deals with emotions) becomes highly metabolically active from 6 months of age. By 18 months the neural foundations of your baby's emotional intelligence are laid. Between 2 and 4 months old, the number of synapses in your baby's visual cortex increases tenfold to 20,000 per neuron. By 12 months, neurons that distinguish native language have found their permanent position. At 18 months the brain's language center experiences a massive synaptic spurt, producing an explosion in grammar. During the first eight years of life, and in particular the first three, there are a number of critical windows for acquiring specific types of intelligence. Once these windows have closed, learning is much more difficult, if not impossible. Babies are particularly open to learning during their first year, as outside of the brainstem (which controls critical life-sustaining processes), very few neural pathways have formed.